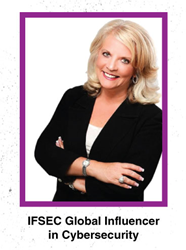 Joyce Brocaglia, CEO of Alta Associates and the Founder of the Executive Women’s Forum on Information Security, Risk Management and Privacy (EWF), has been named a 2018 IFSEC Global influencer – cybersecurity category. Joyce placed in the top 5 of 20 men and women influencers across the security industries. Joyce was recognized for her leadership in cybersecurity as the CEO of Alta Associates and Founder of the EWF. Under Joyce’s leadership, Alta Associates, the leading executive search firm in cybersecurity, was listed by Forbes as one of the Top 100 Recruiting Firms in 2017. Joyce has also dedicated her career to advancing women leaders in cybersecurity. In 2002 Joyce founded the EWF, the nation’s largest women’s organization which engages, advances and develops the most prominent and influential female executives in Information Security, Risk Management & Privacy. “I’m thrilled to have been chosen as an influencer in cybersecurity. Building diverse world class cybersecurity organizations and developing women leaders for over 30 years has provided me with an amazing opportunity to positively influence this industry and develop relationships with remarkably talented professionals like those I share this honor with,” said Joyce Brocaglia. “I look forward to working along with my fellow recipients to continue to better our industry and the current and future thought leaders who protect our families, our companies and our nation." The EWF offers a rare opportunity for women in Information Security, Risk Management, Privacy and other related industries, to come together at their all-female annual National Conference. During this 3-day conference, over 450 industry professionals learn from the most accomplished and influential women who collaborate on round-table exercises, master classes and deep dives. This year marks the EWF's 16th National Conference, “Resiliency in a Hyper-Connected World: Cybersecurity, Risk & Privacy Strategies” held October 23-25th in Scottsdale, AZ. Joyce has not only given women a voice in cybersecurity but also in the United States government through the EWF’s annual Cybersecurity Women on Capitol Hill Public/Private Symposium. During this 2 day event, the EWF facilitates panel discussions and organizes individual Congressional meetings. The purpose is to raise awareness among State and Federal Government staff on the female cybersecurity talent that exists and to increase women’s participation in the legislative process. Joyce has also created University scholarships and leadership development programs focused on developing future women thought leaders. Founded in 1986 Alta Associates is widely acknowledged as the leading boutique executive search firm specializing in Information Security, Cybersecurity, and IT Risk Management. Alta is recognized for their deep understanding of the information security industry and the drives that shape it. Having successfully partnered with global enterprises for over 30 years, Alta has filled many of the most high profile Chief Information Security Officer roles and built world class Information Security, Cybersecurity and IT Risk organizations. Alta is well known for their ability to attract and deliver top tier executives and the teams that support them and is named as one of the top 50 executive search firms in the United States. For more information visit: http://www.altaassociates.com or call 908-806-8442. Founded in 2002, the Executive Women’s Forum on Information Security, Risk Management & Privacy (EWF) is the largest member organization dedicated to engaging, advancing and developing women leaders in Cybersecurity, IT Risk Management, Governance Risk & Compliance and Privacy. The EWF serves emerging leaders as well as the most prominent and influential women in our field by facilitating programs and events throughout the year including a National Conference, regional meetings, leadership development and mentorship programs as well as interaction with global thought leaders through an online community. For more information visit, http://www.ewf-usa.com.